We are delighted to share with you the latest issue of the publication from the Herbert Smith Freehills Global Arbitration Practice, Inside Arbitration. In addition to sharing knowledge and insight about the markets and industries in which our clients operate, the publication offers personal perspectives of our international arbitration partners from across the globe. An exclusive interview with Alexis Mourre, President of the ICC International Court of Arbitration, explores the ICC’s expansion in Latin America and beyond, along with plans for the future and current challenges facing the ICC. Christian Leathley, Head of our US International Arbitration Practice and Head of our Latin America group, shares his experiences of building a practice, his thoughts on the changing landscape of investment treaty arbitration and what it’s like being a real-life “Englishman in New York”. The rise of “giga projects” in Latin America and the disputes landscape that they create is examined by James Doe, Christian Leathley and Noe Minamikata. Our successful representation of the Republic of Costa Rica in a landmark investment treaty case and the implications of this for environmental claims in future investment treaty disputes is considered by Daniela Paez and Silvia Marroquin. Senior Associate in New York Florencia Villaggi shares her perspectives on the arbitration landscape in Latin America today, as a well-travelled lawyer and an Argentinian national with a deep understanding of the region. The enforcement of arbitral awards in Brazil, Chile, Colombia, Peru and Argentina is outlined in a guide prepared by Florencia Villaggi and Lucila Marchini. Our new “Watch this space” page highlights global arbitration news developments to monitor, and ways that you can find out more. We also share a snapshot of our global arbitration practice from 2016-2018. Previous issues can be viewed on our website by clicking on this link. The full digital edition can be downloaded in PDF by clicking on this link. 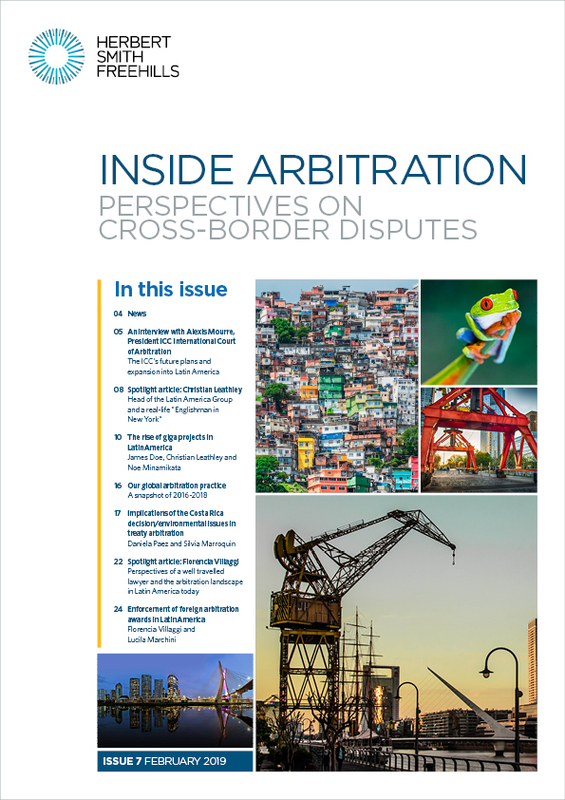 We hope that you enjoy reading issue #7 of Inside Arbitration and would welcome your feedback.